The EleTab monitor stand is made of polished aluminum die cast and heavy-duty steel that features a stylish anti-scratch surface. 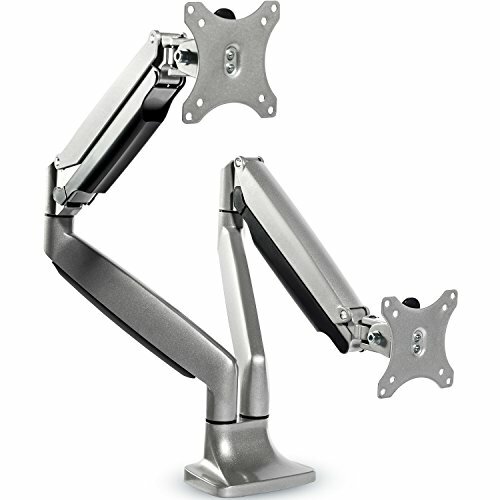 Aluminum interactive counterbalance monitor arm and gas spring device to prevent swinging and tilting when adjusting the display arm. The gas spring structure is used for the monitor's stable weight and easy adjustment, creating a free-floating effect. Turn clockwise to reduce tension for lighter monitors and counter-clockwise to increase tension for heavier monitors. Mounting your monitors is a simple process with detachable VESA bracket plates. We provide a step-by-step manual and the necessary tools & hardware for assembly. The EleTab monitor arm sets up easily and can be attached in two different ways. Use the desk clamp to attach it to the edge of a desk from 0.4" to 3.35" thickness, or use the grommet mount to attach it to any desk with a thickness of 4" or less through a hole. 【Compatibility】The dual monitor stand fits most screens 13" to 32" in size and 19.8 lbs in weight with VESA 75x75mm or 100x100mm mounting holes. 【Ergonomic Comfort】Wider adjustable range with longer arms, height adjustment through the spring arms, VESA plate attached to arm end for screen rotation and tilt. 【Gas Spring System】The gas spring arms provide a 19.8" height adjustable range and provide a smooth adjustment motion that perfectly balances the weight of the monitor. 【Cable Management】Integrated cable management conceals inside providing a neat table top and stylish appearance for the most comfortable work environment. 【Easy Install】Mounts to the back of your desk (0.4'' to 3.35'' thick) via a heavy-duty C-clamp or optional grommet mount which frees up your space the monitor's original base can occupy. If you have any questions about this product by EleTab, contact us by completing and submitting the form below. If you are looking for a specif part number, please include it with your message.